Captain Jim Wigzell has been fishing off the Kona Coast for over 20 years. Starting out in Kona fishing with his brother Chuck Wigzell. He is the owner of “Go Get Em Sportfishing”. When he is not fishing his own boat he either captains or crews on the “Hooked Up” or “Ez Pickens”. Captain Jim’s biggest Blue Marlin to date weighed 1,040 pounds and was caught while he was crewing in 1999. Whether it’s the experienced angler looking for that “trophy” Blue Marlin or the family just looking to have some fun with the kids, Jim will go to the limit to catch fish. On the boat he is very enthusiastic and good with the kids and families. He gets the kids involved in catching the bait and smaller fish when they are available and doesn’t mind helping them land a big marlin if it happens. Jim manages “Pancho and Lefty’s” in Kona town. He is also the Konawaena High School Golf Coach. Jim has his teaching PGA card, and was an assistant pro at a country club in Florida. In Florida he developed a very good junior golf program and this reflects on his ability to work with the kids while fishing on the boat. 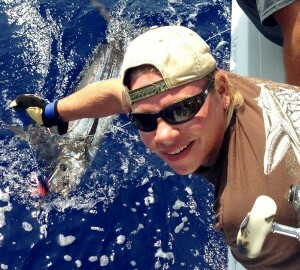 R.J. moved to Kona in 2012 to fish on the “Go Get Em”. R.J.’s father was a client on “Hooked Up” and “Go Get Em” Sportfishing and helped R.J. get the job… (Nice Dad!) He acquired his Captain License and has adapted well to the good life here on the Island. Originally from Oregon he grew up working as a small motor mechanic in his father’s marine business. R.J. crews on all three of our boats and enjoys the opportunity to be out on the water, meeting new people, and “catching” fish. Copyright © 2019 Kona Hawaii Fishing Charter. All Rights Reserved.